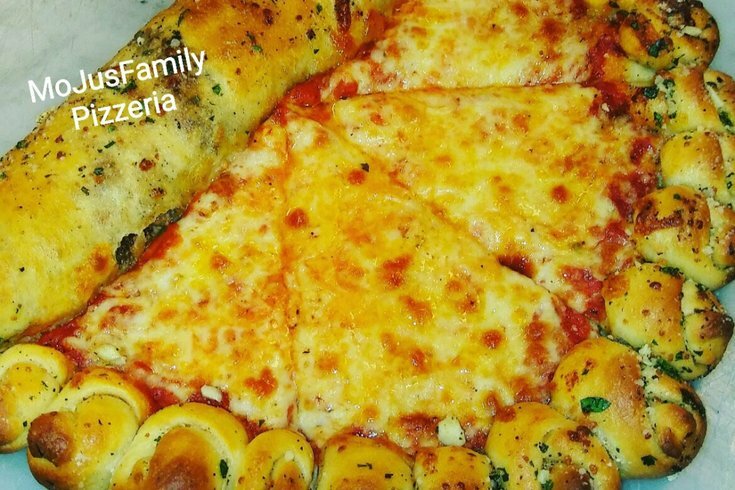 The cheesesteak, stromboli, pizza and garlic knot combo at MoJu's Family Pizzeria. In a move that might make Guy Fieri's blonde-tipped head explode, a Northeast Philly pizza place is combining four classic dishes into one meal: pizza, stromboli, garlic knots and cheesesteaks. The owner of MoJu's Family Pizzeria, located at 2501 E. Westmoreland St., said in an email Monday that they're now serving the new "Philly cheesesteak creation." The stromboli serves as a crust for a half of a pizza pie. Owner Moe Cherifi told PhillyVoice that the stromboli is filled with steak and mozzarella. Substituting for the crust on the circular side are garlic knots. Cherifi said the combo is completely customizable. They go for $14.99 a pop. It's a gargantuan mix of cheese and carbs, truly a sight to behold. 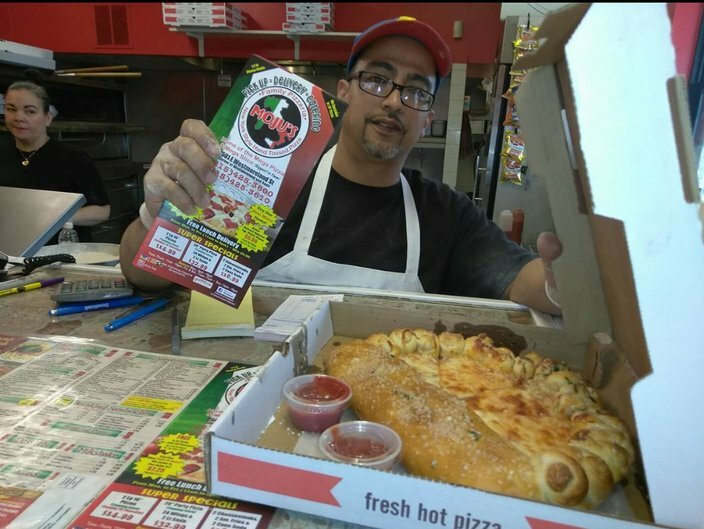 Moe Cherifi, owner of MoJu's Family Pizzeria, with his cheesesteak/stromboli/pizza/garlic knot creation. To be clear, the combo isn't brand new, as it was featured on CBS Philly this past November. Much like Lorenzo's on South Street, MoJu's is known for it's big slices, which is why reporter Vittoria Woodill went to check out the pies that are 28 inches in diameter. But hell, this is the first we're hearing about it, and such an ambitious fusion of Italian comfort foods is worth noting.